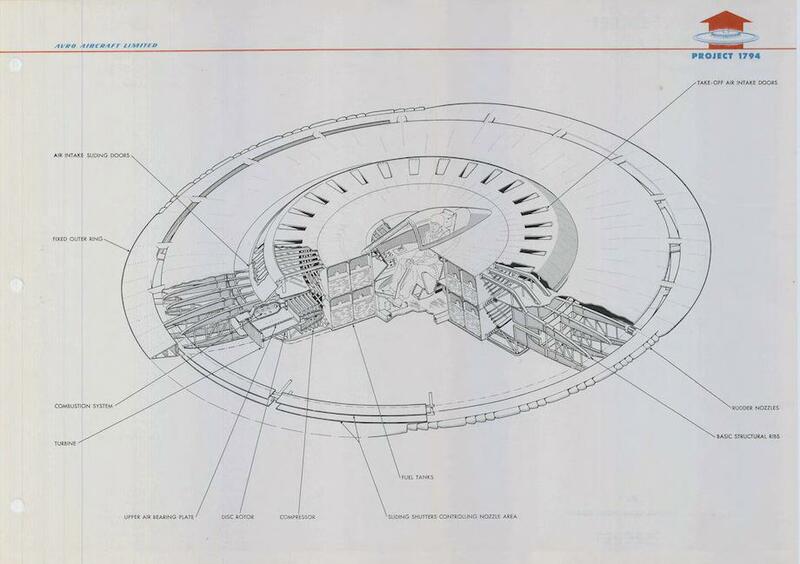 Flying Saucer: The full report on a government-commissioned prototype. In September, a National Archives blog devoted to recently declassified documents published a post about an intriguing set of records from the aeronautical systems division of the U.S. Air Force. During the 1950s, according to these documents, the Air Force had contracted with a Canadian firm, Avro Aircraft Limited, to produce what can only be described as a flying saucer. While the National Archives provided a few images from “Project 1794” last year, the entire report is now available online. The report summarizes Avro’s work on its initial contract with the Air Force, which financed a feasibility study to test the systems and principles that would be necessary to create what Avro called “a flat vertical take-off and landing aircraft.” The ship was to reach a top speed between Mach 3 and Mach 4 and be capable of flying at 100,000 feet and ranging 1,000 nautical miles. 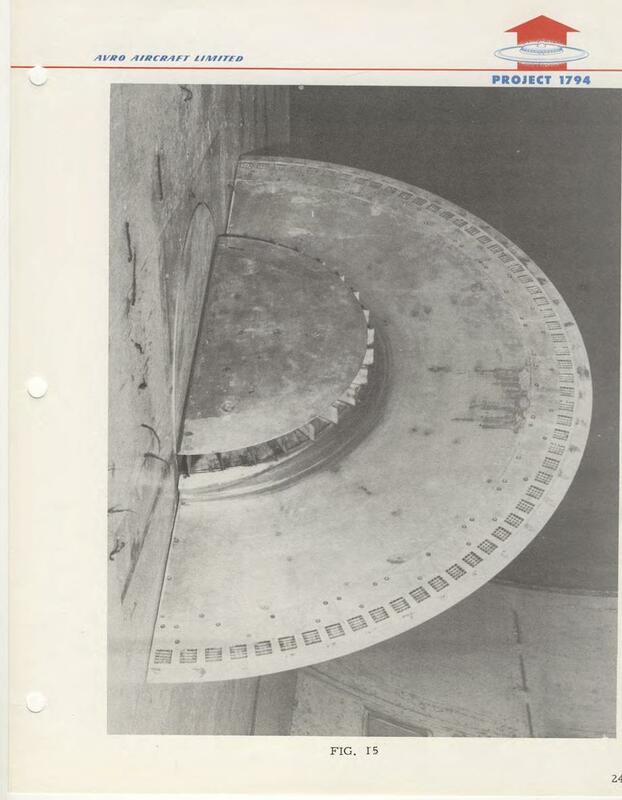 The document contains several schematics detailing alternative solutions to some of the engineering problems that the flying saucer posed. 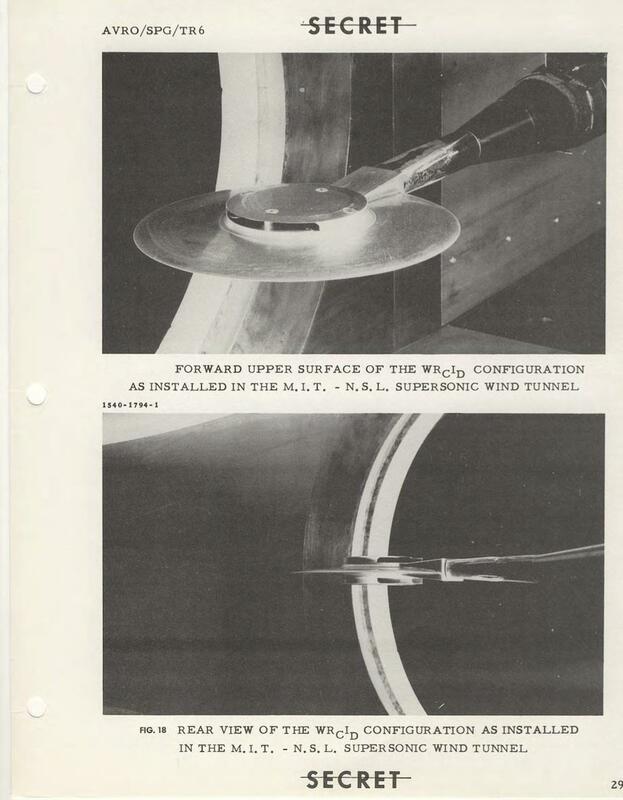 Avro described 500 hours of wind-tunnel tests done with a scale model and included photos of that process, graphs of their results, and assessments of remaining issues. But the government decided to fund work on a smaller and less grand saucer prototype, the Avrocar, instead. Like a helicopter (not yet available for combat use), this aircraft could hover near the ground, access tight spots, and help troops in need of reinforcement or resupply. Plackett points to video of tests of the Avrocar in which the vehicle doesn’t get more than a few feet off the ground. Pilots found it rocky and unstable in motion, even once it managed to rise further into the air. In the end, the vision of a U.S. government flying saucer on any scale was scrapped. Avro closed its doors in 1962. Project 1794 Final Development Summary Report, National Archives.